Make it a four day weekend with us here at Snow Trails, thanks to President's Day! Extended hours for these Peak Days on the slopes and in the Vertical Descent Tubing Park. Enjoy skiing, snowboarding, and snow tubing with family and friends! 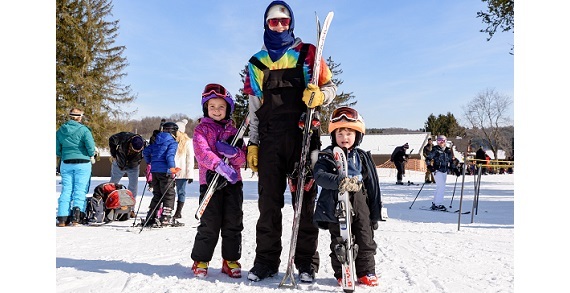 Enjoy skiing, snowboarding, and snow tubing at Snow Trails in Mansfield, Ohio. Broad slopes and pristine snow conditions await you December through mid-March, thanks to major investments in snowmaking equipment. The newly expanded beginners area is complete with two surface conveyor carpet lifts and a beginners double chairlift. Snow Trails' expansive rental center offers all the equipment needed with self-service boot fitting, plus skis and snowboards sized and set just for you. Friendly instructors are ready to introduce you to your equipment and techniques for learning made easy! All-inclusive children’s programs and lessons for all ages and abilities are available. You will find the full-service ski shop on-site, plus two restaurants and bars in the spacious rustic ski lodge, slope-side. Snow Trails' kid friendly snow tubing park is complete with a surface conveyor carpet lift and tubing lodge with snack bar, restrooms and patio fire ring.